Heaven's Shadow is the first game published under the Bedroom Wall imprint. 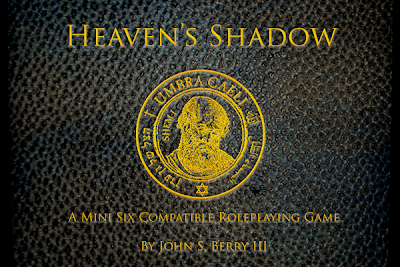 Written and designed by John Berry and compatible with the Mini Six rule system created by AntiPaladin Games, Heaven's Shadow is a game of faith and assassination set in the modern world. Players take on the role of Shadows, assassins in the service of God, empowered by Faith to hunt down and eliminate the ancient Nephilim, immortal demonic beings in the guise of normal men and women, who have dwelled on Earth since the days of the Great Flood. Working in concert with a secret Agency of fellow believers, the Shadows are tasked with the assassination of these evil beings in order to end their Path of Sin. The system is based on Mini Six, the excellent OpenD6 variant developed by AntiPaladin Games, modified to suit the trappings of modern-day supernatural espionage. For those unfamiliar with the classic D6 system, it is a simple D6 dice pool system designed to be easy and quick to run and play, and has been used in such classics RPGs as Star Wars and Ghostbusters. Player skills are enumerated by a number of dice, which are then rolled against each other or a target number to determing success. 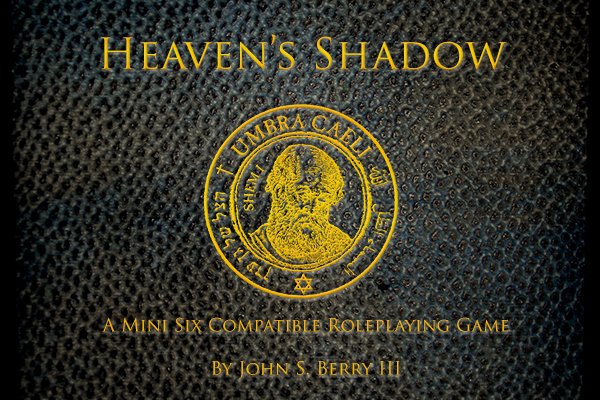 Heaven's Shadow is available exclusively via DriveThruRPG, in both print and digital forms.